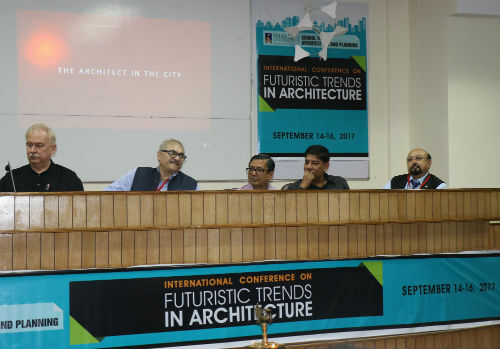 Greater NOIDA: The International Conference on FUTURISTIC TRENDS IN ARCHITECTURE, organised by the School of Architecture and Planning, Sharda University, concluded with identifying ways and means to ensure that India’s architecture and architects measure up to the challenge of building an innovative, smart and empowered urban India. The inspiration for this event came from the Japanese development model of the sixties when they demonstrated that constraints and hazards can stimulate creativity and innovations. Leading Japanese architects like Kenzo Tange and Shigeru Ban creatively generated solutions that exemplified futuristic architecture. The Smart City initiative of the Government of India is one of the first of its kind in the country’s history. Successful implementation of this programme is heavily dependent upon smart, innovative architecture and infrastructure within foreseeable future. Make in India has been a motto for empowering our large workforce. Futuristic architecture has to seek to engage and build capacities of the younger generation towards this end. More and more Architects seem to trade off their creativity against the compulsive universal conditions such as climate change, resource constraints, affinity for traditions, mechanization of skills & processes to name a few. The award of Pritzker Prize 2017 to three Catalan architects, brought home the increasing validity of “shared creativity” in an era which expects to walk into a heavily urbanized world, much of which may be impoverished and yet indomitable in their determination to be partners of joy on an ailing planet, the Earth. The causative conditions resulting in the character of the determinants must be appreciated to be able to tame them (or otherwise). Among the plethora of determinants, architects would need to skilfully scrutinize to recognize the relative importance and visualize the sum result of their various combinations that would sufficiently fulfil the requirements of functional efficiency, sustainability and aesthetic sensibility. Through architecture, identities are created and sustained. Both culture and environment are expressions of highly complex and sensitive ecological processes that evolve at varying speeds. Their dynamics are only partially understood or seen like the proverbial ‘tip of the iceberg’. Architects need to be skilful not only in capturing the essence of a futuristic context but also in visualizing the consequences of their assumptions and assessments. Thus the contribution of an architect’s intuition thus continues to play a pivotal role by responding appropriately to a context, including its dynamism. As countries are racing to push forward the frontiers of science, awareness of new technologies and management systems, Architects have access to a huge and growing storehouse of materials and technologies to choose from. They have demonstrated their power of creativity by innovative use of materials and technologies without discriminating between the old and the new. India’s diversity and magnanimity encourages her to be perceived as a microcosm of the world. Thus architects in India have an unprecedentedly large opportunity to create good architecture and also mould the mind set of urban India appropriately. The younger Architects must recognize the rarity of the opportunity and seize it by taking lessons from those who strove to find a face of post colonial Indian architecture with exemplary courage and relentless efforts. The training at Schools of Architecture (SOA) enables graduates to translate hazy awareness into tangible designs not only in architecture but also in allied or other fields. The trend to move out of architecture seems to be on the rise in India. Recognition of this trend as a positive outcome of the current pedagogy may encourage structural changes in the same, leading to flexibility in terms of exit from the programme and creating pathways to specialized training in desired fields.